Location Location! Beautiful Beverly Hills secluded private farm! 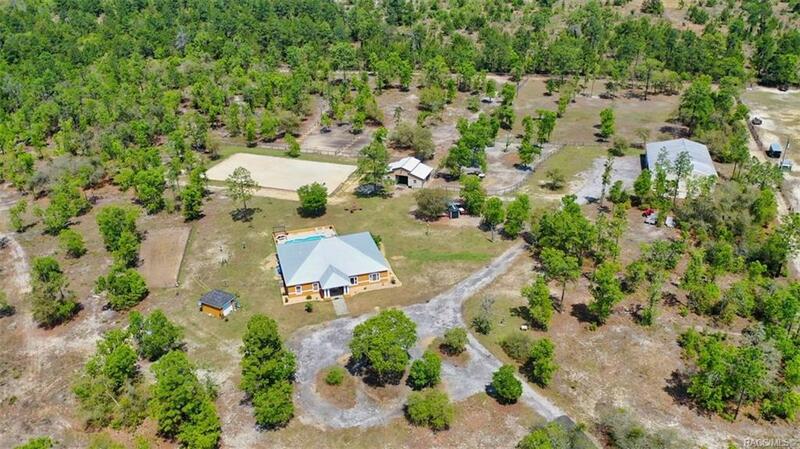 This very rare and private property is bordering Pine Ridge, the same convenience and paved roads, but without restrictions. The 4/4 pool home is perfect if you are looking for privacy and the ability to have both horses and livestock. This property boasts 14.38 acres totally fenced for your pets, a 2500+ square foot home, 36x24 center isle barn with electric and water, 10x30 chicken coop and run, 2 pastures, 1 dry paddock, 40x20 meter dressage riding arena, a 50x20 RV pad, a 10x16 detached garage, AND a 50x80 metal building for all your toys and farm equipment! There is also a huge fenced and irrigated area for a vegetable garden. Truly a must see! Directions: Pine Ridge Blvd, North On Buckskin, Left On Cimarron, Right On Buffalo, To The End, Right On Conestoga, To The End Of The Cul-De-Sac, See Gate And #5251.